Both games appear to be delisted everywhere. Update: It doesn't look like either game is returning, unfortunately. Warner Bros. hasn't explained why the game's have been delisted on digital stores but did confirm with us that they're no longer available. "Lego: The Lord of the Rings and Lego: The Hobbit will no longer be available for sale in digital stores," said a Warner Bros. representative. "The games will remain in players’ libraries if they already own them." 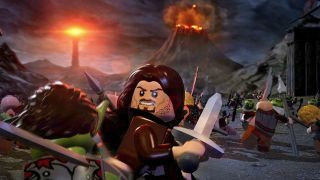 Original Story: If you were planning a trip to the Lego version of Middle-Earth, hopefully you snatched up Lego: Lord of the Rings and The Hobbit when they were free on the Humble Store last month. Both have now vanished from Steam, along with other stores. Spotted by Reddit user SuperMoonkey, the games are no longer available in any digital stores. They don’t appear if you search on Steam, but the pages do still exist, though without the purchase option. Expired licenses are often the reason from games being delisted like this. It happened with Activision’s Spider-man games, while Alan Wake was delisted because of its licensed soundtrack. Warner Bros. Interactive Entertainment publishes the Lego games, while Warner Bros. itself licenses the film and video game rights from Middle-earth Enterprises. It’s worth noting that other Middle-earth games haven’t vanished. Shadow of War and Shadow of Mordor, for instance, are still available. Unlike Monolith’s open-world games, the Lego games are based on the films. The film and game rights are two separate things, and while Warner Bros. had licenses for both, it’s possible it could have lost one. If you already own either game, you’ll still be able to play them, but make sure to activate your keys from Humble soon, as they do expire. And the games may reappear. Alan Wake’s delisting, for instance, was temporary. I’ve reached out to Warner Bros. for more details.